What is Egoscue & Posture Correction Therapy? 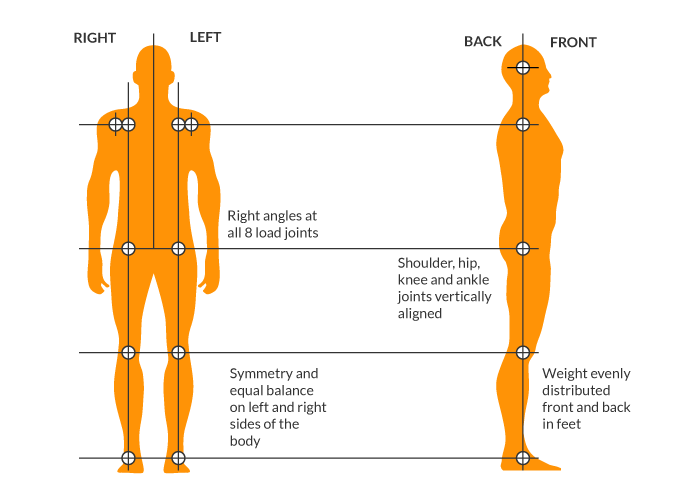 Nobody is perfect, but if I asked you to stand up, and not think about your posture, then I would look to see if your ankles, knees, hips, spine, shoulders and head were stacked symmetrically on top of one another, and balanced left to right and front to back (see picture). The closer you are to this alignment, the stronger, the more stable, and the more efficient your body will function. Your muscles keep your posture in alignment and require a variety of work to stay functional, balanced and healthy. Our modern-day lifestyles rarely allow the diversity and frequency of movement that maintains this balance. Even from a young age, we spend so much time sitting at a desk at school, and many of us have desk jobs. All of this combined with injuries and other stressors can lead to misalignments in your posture. Postural misalignments causes certain muscles to compensate and can make them more susceptible to injury and pain. Joints that function less efficiently due to muscular imbalances can lead to abnormal wear and tear, impingement and pain. Ultimately, the ‘unexplained’ source of many health conditions is that your body does not work the way it was designed. If you want to stop a leak, you don’t continue to put buckets down to collect the pooling water; you fix the pipe! This is why painkillers, surgery, braces, general exercises and many therapies often won’t help in the long-term because they only focus on the symptom, rather than the underlying root cause. Eventually the pain may return in the same location or nearby. The Egoscue Method on the other hand, aims to tackle the root cause of your pain – which in many cases is poor posture. Founded in 1978 by Pete Egoscue, it uses gentle and targeted posture correction exercises to bring your body back into better alignment. The aim is to end your current pain (if you have any), feel more confident about how you look, and reduce your risk of future pain and injuries.